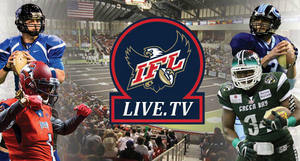 DES MOINES – The Indoor Football League has announced the launch of IFLLive.tv for the start of the 2015 season. Starting February 28, 2015, fans will have the opportunity to watch each IFL game live on a fully integrated, digital platform powered by American ONE Sports and EverSport.tv. “The IFL is very excited to partner with America One and Eversport.tv to create IFLLive.tv. This new service will make a faster, more efficient online viewing experience for all of our fans across the country,” said IFL commissioner Michael Allshouse. Each game will be available on multiple platforms, including tradition web browsers on PCs, tablets, and mobile phones using the iOS and Android operating systems. IFLLive.tv includes responsive web technology ensuring an optimal viewing experience on any device. With IFLLive.tv, fans can take their team where they go. •	Season Pass ($110): View every game live with a season pass, allowing access to all 73 games including the playoffs and the United Bowl Championship Game. •	30-day Pass ($35): View every game live for 30 days from point of purchase. •	Day Pass ($10): Live 24-hour access from the point of purchase. Iowa Barnstormers games can be live streamed HERE. The 2015 Indoor season will kick off Saturday, February 28, 2015 with three games, including the Iowa Barnstormers at the Cedar Rapids Titans. An Iowa Barnstormers game is the perfect event for your next group outing! Discount ticket packages are available for groups of 15 or more and include a video board announcement. For more information, log on to www.theiowabarnstormers.com or call 515-633-2255.